About pointer: hold down the button to keep the light on. Warranty: Lifetime warranty. You can get another USB receiver if you need it within 2 years of your buy (for someone who lost the USB receiver in daily life). 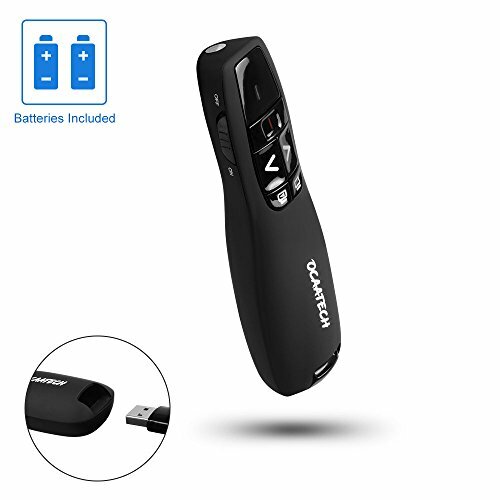 Long Distance Control & Batteries Included: Up to 50 foot wireless range for freedom to move around the room; 2 x AAA battery included, which provide you over 50 hours using time,no need to buy batteries by yourself. Universal Compality: Supports MS Word, Excel, PowerPoint , ACD See, website etc. Compatible with PC / Laptop / Macbook / Tablet / Windows / Mac OS / Android / Linux. Warranty & Support: We want you to love this product. Our easy 100% return policy is designed with customer service in mind. If you have any questions or issues, please don't hesitate to contact us. If you have any questions about this product by Yeegewin, contact us by completing and submitting the form below. If you are looking for a specif part number, please include it with your message.